The Other Dave wrote: I suspect it may be executive decision time, or else we'll be talking in circles for months. Of the above list, there are only 2 I have absolutely no interest in playing/investing more money. and 3 where scale would really bother me due to prior investment in the period. How about we cut the list down a little. Everyone gets to veto one idea, without any recriminations or hard feelings and then we shall see where we stand. So, with apologies to Job, I'd like to veto Warhammer 30K. I actually have a small force of Heresy Era Word Bearers, but given the prices involved and a seriously waning interest in Warhammer, (plus it's stretching the definition of historical gaming a bit ), I doubt I will be expanding that force any time in the forseeable future. I'd be up for pretty much any of those, although I suppose I might use my veto on Cthulhu. The Other Dave wrote: I'd be up for pretty much any of those, although I suppose I might use my veto on Cthulhu. C'mon guys, be ruthless now. I hate to do this, but I'd like to use my Veto on Roman invasion of Britain. I like the idea of ancients, and I would do the Gallic wars in heartbeat, but the lack of set piece battles during the Roman conquest and colonization kind of dampers my desire relative to the other exciting ideas. And, yeah, I'm cool with 30k on the chopping block. I just threw it out there to see if we could entice some usually non-historic players. job wrote: I hate to do this, but I'd like to use my Veto on Roman invasion of Britain. I like the idea of ancients, and I would do the Gallic wars in heartbeat, but the lack of set piece battles during the Roman conquest and colonization kind of dampers my desire relative to the other exciting ideas. There were a couple, Watling Street being the most famous battle, but they certainly weren't anywhere near the scale of the wars with Hannibal. No worries though, vetoed it is. My vetoes are gone, but! I wouldn't want to do sengoku jidai unless we could find a ruleset that actually modeled the way Japanese armies fought then (mixed formations of fairly slow ponies with infantry running alongside, rather than the strictly-separate formations of Cavalry! and Infantry! that most wargames rulesets model), and it's my understanding that there really aren't any. The Other Dave wrote: My vetoes are gone, but! I wouldn't want to do sengoku jidai unless we could find a ruleset that actually modeled the way Japanese armies fought then (mixed formations of fairly slow ponies with infantry running alongside, rather than the strictly-separate formations of Cavalry! and Infantry! that most wargames rulesets model), and it's my understanding that there really aren't any. Both Hail Caesar and Pike & Shotte have optional rules for modelling such a unit if you want to use them. Since those games are fairly abstract, it's easy to do it as you don't really need to worry about where specific attacks are coming from. 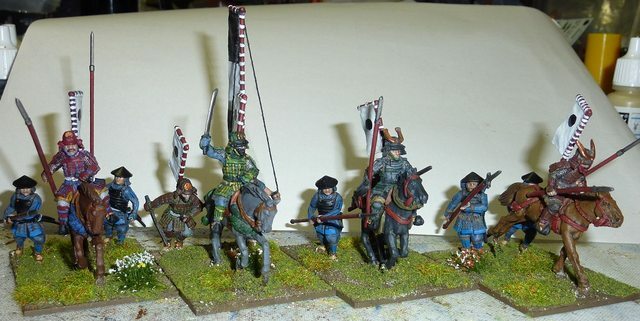 A lot of the Sengoku Jidai involves formations and styles that don't fit easily into the traditional wargaming stereotypes, but it really isn't an issue if you put your mind to it. Huh! And it's not just re-skinning a cavalry unit? That's pretty cool then. The one period on the list I dont have that much interest is the ECW. Since it seems to be mostly the four of us discussing this shallwe have another round of vetoes? @Lovejoy: I still have every intention of doing F&I was with you with Musket and Tomahawk at some stage, so no need to worry. It probably is better at the skirmish scale anyway.